I am a certified court interpreter for the Czech and English language. 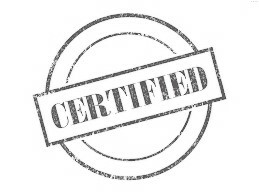 I do certified translations from English to Czech and vice versa (I am also certified for the German language). I will provide official interpreting at a court hearing, before a notary, registrar, before state and local authorities, at a wedding ceremony or another officially documented event. If you need a Czech driver's license, I can get you in touch with a Czech driving school and interpret during the driver's license exam. I do court-certified translations (= official/sworn translation with a round stamp) of virtually all types of official documents in Czech, German and English (for details see the tab Translations). The certified translation must be literal and contain all the information given on the translated document, i.e. also the letterhead and all the stamps must be translated. 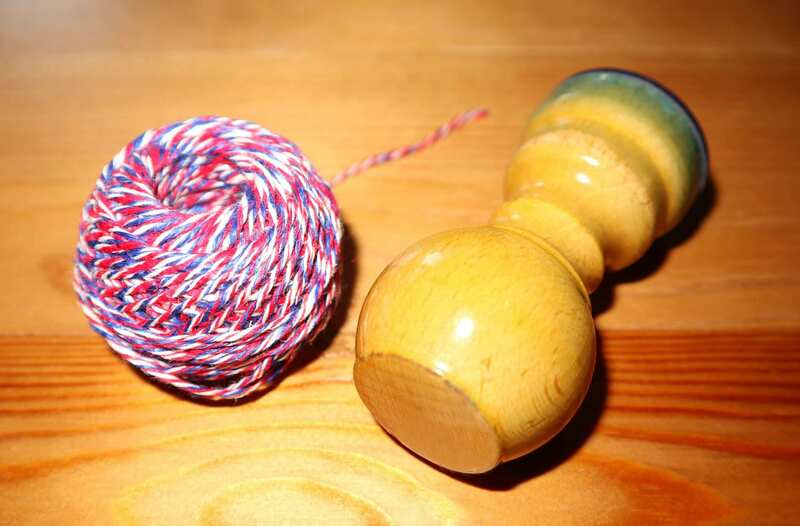 The certified translation must include interpreter's certification clause with his signature and bear his official seal, which is a round stamp with the small national emblem of the Czech Republic and a diameter of 36 mm. Finally, the certified translation is bound with the translated document by means of a tricolour ribbon and it is sealed so that both documents form an inseparable whole and no page can be replaced or substituted without first spoiling the seal. All certified translations and acts of interpreting are registered under a registration number in the interpreter's journal. Official interpreting in a courtroom, at Czech registry office, meeting before the notary, shareholders' meeting, police, immigration office (for details see the tab Interpreting). 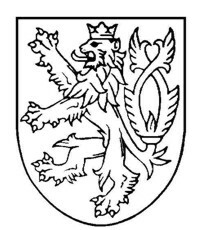 I was appointed Certified Court Interpreter by the Regional Court in Brno in 1998. As a certified court interpreter I am bound to secrecy and I have to be impartial. The work of court interpreters in the Czech Republic is regulated by Act No. 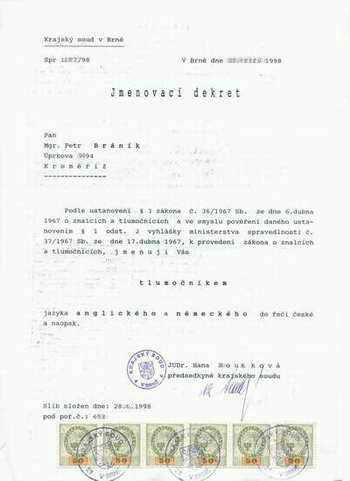 36/1967 Czech Statutes, on experts and interpreters, as amended. The oath of a court interpreter reads: "I promise that in my interpreting work I will strictly observe the law, I will act impartially to the best of my knowledge, I will make full use of all my knowledge and I will maintain confidentiality about the facts that I have learned during the performance of interpreting work." I provide services of a certified court interpreter in the following Czech towns and cities: Zlin, Kromeriz, Uherske Hradiste, Otrokovice, Holesov, Bystrice pod Hostynem, Vyskov, Brno, Prerov, Prostejov, Olomouc, Prague.